With faves like Gremlins, Piranha, and The Howling under his belt, Joe Dante found a way to channel his love of horror into more mainstream flix for a general audience while still appealing to his fan base. 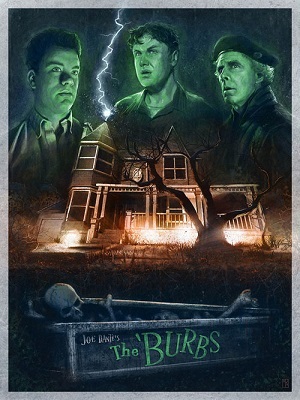 For me, Matinee and The ‘Burbs both have a lot to offer for horror nostalgia. 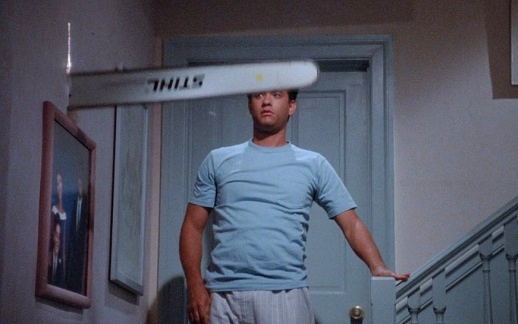 At the same time, viewing them again for the first time since the days when I worked in a video store back in the late 80s/early 90s, I find the more commercial aspects of each film rather…commercial. Here’s what I got and didn’t get out of each. 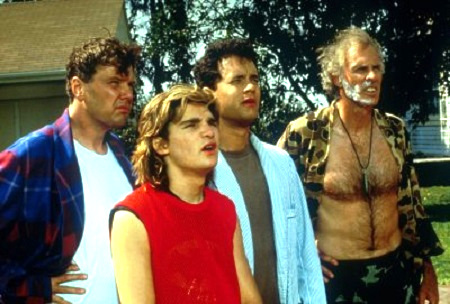 Sort of like Fright Night Lite (without the vamps), the great thing about this “family friendly” suburban comedy is that it has you expecting a perfectly logical explanation for all the creepy things going on around the new neighbors’ home. Instead, it doesn’t back away from being devilishly dark in the end. 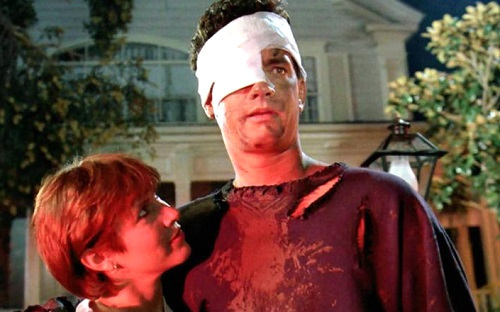 Couple Tom Hanks and Carrie Fisher along with their quirky friends, including the likes of Bruce Dern and Corey Feldman, become suspicious when one of their neighbors disappears…and they see the weirdos in the creepy house on the block doing strange things like digging holes in their yard at night and dumping overloaded trash bags in the garbage. 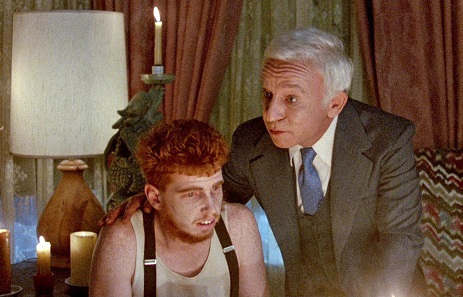 All this spooky fun and comedy works best up until the point when the gang finally decides to go confront the new family. As soon as they enter the house and we meet the weirdos at last, the mystery loses its impact. The film goes through the hokey mainstream motions, and it wasn’t until the final confrontation that I was really feeling the fun again. Not to mention, I think this is perhaps one of my favorite performances by Cory Feldman, yet his character is sorely underutilized. 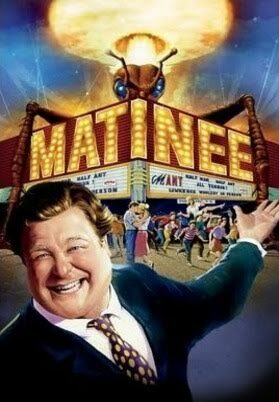 On the infamous day that every sign of Roseanne was wiped from the face of syndication existence, it was the first day in at least 10 years that there was no John Goodman in my life, so I got a dose of him in Matinee, in which he stars as a horror director inspired by the real William Castle of House on Haunted Hill fame (with some nods to Hitchcock thrown in, as well as plenty of visual references to Vincent Price). My mother introduced me to the original House On Haunted Hill when I was a kid, describing to me that when she saw it in theaters, a skeleton flew down the aisle just as one rose up from the acid pool in the movie. Little did she know she was a piece of horror cinema history—and sadly, I never thought of showing her this movie, which she would have loved. 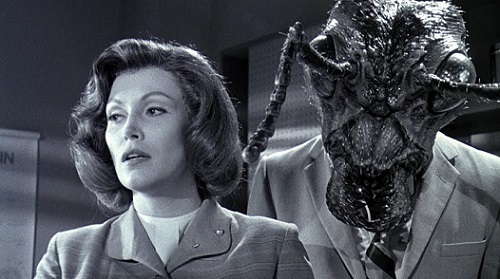 Matinee revolves around the director’s plan to bring his immersive horror movie experience to a theater in Key West the week before Halloween, 1962. However, much of the focus is on the kids who plan to attend (it’s sort of a coming of age film), the protestors who think the movie is offensive, and those who believe banning it is against the first amendment. In other words, things just don’t change in this country. The focus instead is on the 60s, and the spirit of the times is captured with references to JFK, Russians, and bomb drills…not to mention it features an awesome 60s soundtrack including Little Eva’s “Loco-Motion”, “My Boyfriend’s Back” by The Angels, “The End of the World” by Skeeter Davis, “The Great Pretender” by The Platters, and more. 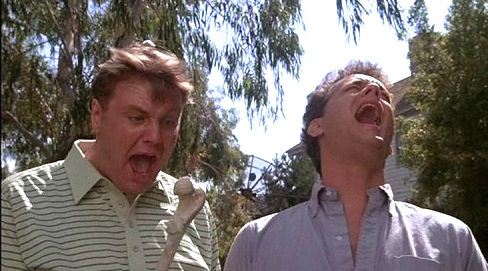 It’s not until about the last 40 minutes of the film that it totally recreates the horror novelty at the theater. 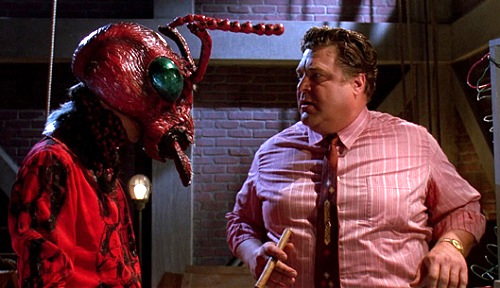 In this fictional take on Castle, Goodman’s character is promoting a movie called MANT! 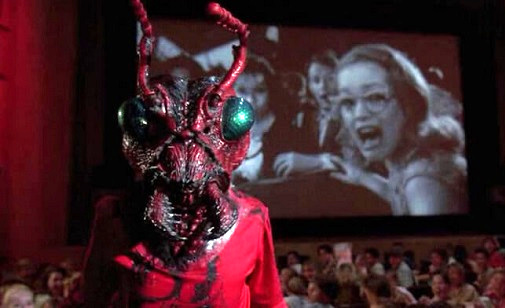 The opening of the movie puts us in the theater, filled with horror props, and we get to see a good chunk of MANT!, which is clearly a nod to The Fly. But everything that can go wrong on opening night does, making the final act of Matinee the part to watch for. 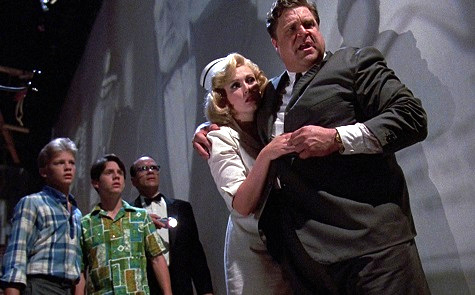 And just like Feldman in The ‘Burbs, Cathy Moriarity, who plays Goodman’s wife and the star of MANT!, kind of steals the show…yet she’s totally underutilized. 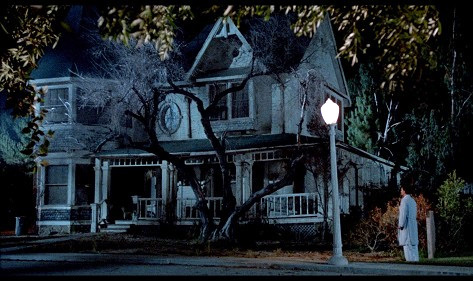 This entry was posted in Living in the 80s - forever, Movie Times & Television Schedules - Staying Entertained, Scared Silly - Horror Comedy, Sound Check - The Songs Stuck in My Head and tagged 1980s, 80s, horror comedy, Matinee, The 'Burbs. Bookmark the permalink.